Personal home automation and sensor networks are already in more than 32% of US homes today. This is primarily in the form of home security systems in which each window and door typically has a magnetic sensor or reed sensor to indicate the open or closed position. There are also motion detectors and in some systems an audible detector to sense the sound of breaking glass. 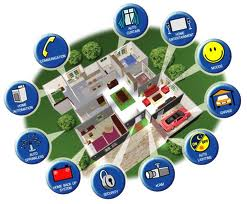 In the last 20 years the security system has migrated from a wired to wireless. Using a central hub form monitoring the wireless signals, and coupling into a personal WiFi home network, there are now a number of new possibilities available to the consumer for personal home automation. Nearly everyone carries a smart phone or other enabled device, which with a simple app can now monitor and control the entire home. At its simplest, Belkin has introduced a family of products to control any appliance which can be plugged in to an outlet. Their WeMo devices are WiFi enabled to work with the home network or cellular communications. The included app allows homeowners to set automated schedule to turn things off and on. Pool, Spa and outdoor lighting is automated with both wired and wireless units from Pentair Pools. These can be controlled via a dedicated unit or with an app on a smart phone. The pool motor is on a fixed schedule to circulate the water, and the heater can be programmed to have the spa at temperature when you come home in the evening. These will even change the lighting both in and out of the water, as long as the fixtures are connected to the system. It has been a challenge for both the consumer and the various providers to find a way to integrate all the various home automation systems together. As indicated above, there is a network for the outside pool, the inside security system, the various lights and appliances, and probably a fourth for the HVAC (heating, ventilation, air-conditioning) thermometer. And with the Internet of Things (IoT) coming into play, soon the major appliances (washer, dryer, dishwasher and refrigerator) will be wirelessly accessible. Homes with dedicated wine lockers, refrigerators and cellars will want to monitor and control the temperature and humidity remotely. Studies are finding that the security system service providers are getting the majority of the attention for which control panel will be the main interface to all the systems. Once the major expense for a basic system has been paid, homeowners may also want to include video cameras for monitoring and storage. The security system will have the central command and control screen in the house from which everything can be accessed and controlled. The command center can be bypassed by an authorized mobile device running the appropriate app. And the command center can easily message alerts or notifications to the mobile user. This can be as simple as a text that a door or window has been opened, or as sophisticated as establishing a video conference call when someone rings the door bell. The next time you are walking around your house, take note of how much personal home automation you have already, and what sensor networks are installed. Think about how much this saves you in both money (from reduced electrical, water and gas usage) and time (how long would it take to manually turn each item on and off, and waiting for it to run through a cycle). And just imagine in which ways you could be using technology and automation to make life even more interesting and enjoyable.